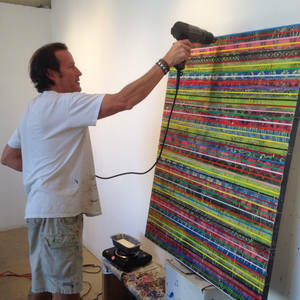 BRAD ELLIS BIO Brad Ellis is a mid-career, Dallas based artist whose focus is on abstract painting. He has continually experimented with imagery from tightly rendered, systematic patterns to loosely composed, expressionistic compositions. Consistent features of his paintings are his interests in color, form, surface treatments and the pure physicality of paint and various collage elements. He has distinguished his career by embracing the ancient medium of encaustic which is hot wax painting and is a process by which heated bees wax is mixed with pigments and applied to board or canvas and then fused to the surface with a heat source. Brad earned his BFA from the University of Tulsa and his work is represented by several art galleries in the U.S. His paintings are displayed in many prominent private and corporate collections throughout the country. As well, his work is featured in two new books, Texas Abstract, Modern + Contemporary, published by Fresco Books and Encaustic Art In The Twenty-First Century, published by Schiffer.